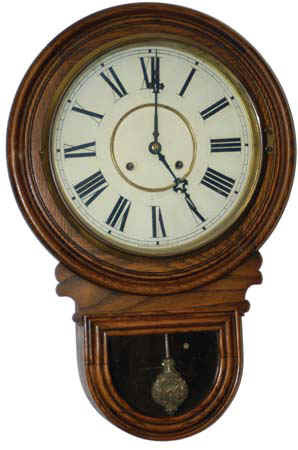 Waterbury Clock Co. wall clock, the "Andes", ca 1910, made with a calendar and no calendar, always in oak. The case with original dark finish, beautiful wood grains, and generally in excellent condition. A scuff mark or two, but nothing that won't go away with normal maintenance. It is 24 inches high, wood door on the base, brass bezel and rings on top. The 12 inch dial is exceptionally nice to be 95 years old. 8 day, half hour strike on a coil gong. Two labels on the back both excellent. Clock runs, strikes, looks great. Ly-Waterbury #710.